When SKECHERS announced the sponsorship signing of top American marathoner Meb Keflezighi a lot of runners laughed and questioned Meb. Now we think different. The SKECHERS designers created a shoe just for Meb and the London 2012 Olympics, at first known as GoMeb. As we all now know, Meb finished fourth in the Olympics, an incredible achievement. Runners, including myself, started to be more curious about this racing flat. Later SKECHERS announced that they would release the shoe now named as GoRun Speed. The GoRun Speed has bold colors, for sure, The ones I have used are red/lime. The upper feels light and it almost seem less. When looking at the shoe,you get an impression and feeling of speed. The upper is constructed by an open flexible mesh and mostly welded overlays. Most areas around the arch is supported by SKECHERS logo type "S"that has been welded onto the mesh. The laces row and some areas that need more support has extra suede look alike material. The upper breathes very well and the fit is snug and preform without cramping your toes during fast runs and marathons. The suede parts in the fore foot were noticeable the first couple of runs but after a few "break in runs" it was not a concern as the soften up. The inside of the heel cup has also suede like material that offers a secure fit, it actually adds a faster feel to the shoes. The GoRun Speed has a 4mm drop midsole, the same as the GoRun2. The biggest difference between the both shoes is a carbon fiber plate, placed in the GoRun Speeds mid sole. This plate provides extra support, firmness and responsiveness. The mid sole offers great protection and an easy toe off. The transition is smooth and you get a sort of "snap" sound when pushing off. The outsole carries the same "sensors" as other shoes in the Gorun series but has more blown rubber under it. Some of the sensors in the center of fore foot area shows more wear then others after 75 miles of running (which included Boston Marathon). This is an area that can be improved for better durability. I have been mainly using the GoRun 2 for my Boston Marathon build up. When I recevied the Go Run Speed, I knew this was going to be my Boston Marathon Racer. The GoRun Speed offers a less flexible run then the GoRun 2 but a faster and secure feel. GoRun Speed is a true "old shool racer" that makes you feel fast on race day. The shoe is built low to the ground and the road grip is secured. You get a smooth and fast toe off and I love the "snap" sound of it. 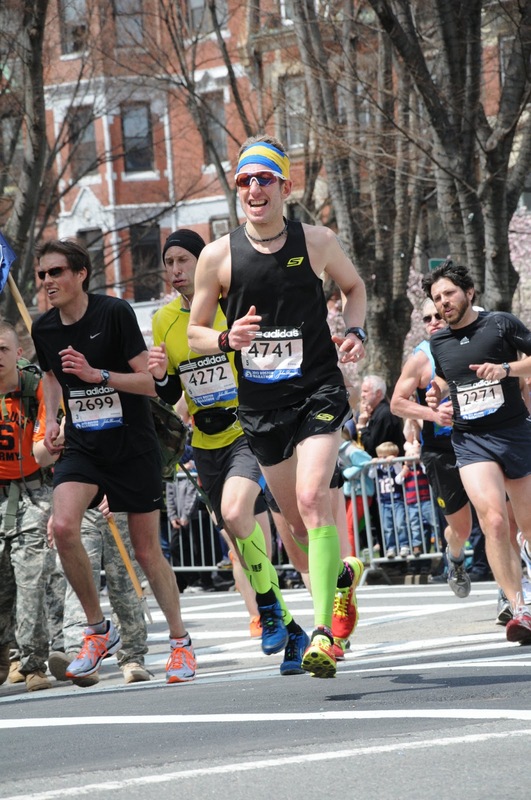 When I had to dig deep the last couple of miles in Boston, I really put a trust in my GoRun Speed. They did not let me down! As my own preference, I have replaced the laces with lock laces. To me the lock laces brings the Go Run Speeds to the next level. Meb told the designers of SKECHERS what he needed for the London 2012 Olympics.The result is the really fast GoRun Speed. A great racing flat that keeps impressing me!